Its Birthday for my dear hubby 🙂 Today it’s busy and really big day for me. He is on leave today, so i have settled down in kitchen and preparing all his fav. recipes from morning. Just now got time to sit and relax. But i am really happy that he took leave for me. Yes of course, evening we have a big plan. Going out for a pretty dinner and we shall go for movie also. Crumble the paneer and knead it nicely. Combine rava and baking powder. Knead all to form a smooth dough. Make small marble sized balls and cover with a wet cloth to avoid dryness. In the mean time, heat a pressure cooker. Add sugar and water to it. 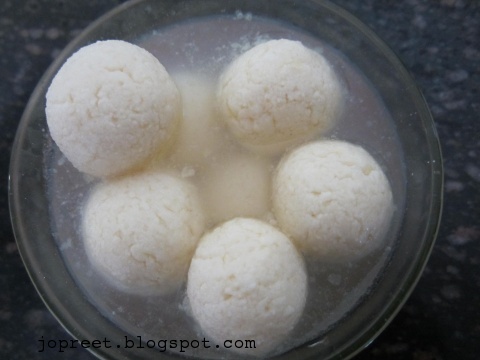 Once the sugar is completely dissolved and syrup starts boiling, drop the paneer balls carefully. Close the lid and cook for one whistle. Remove from the heat and keep the pressure cooker under running tap water. It is done to cool the cooker so that we can immediately open the lid. 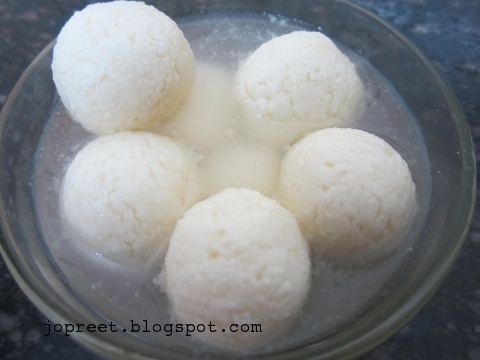 Now open the lid and transfer the rasgulla along with syrup to a vessel. Add rose water to it. Allow to cool. Keep it in refrigerator for 6-8 hours and serve chilled. Convey our best wishes to your husband on his birthday..
Nice treat you have planned for him..all the dishes look tasty and perfect. Very Sweet Post. Thanks for sharing ! Belated Birthday Wishes to your hubby! 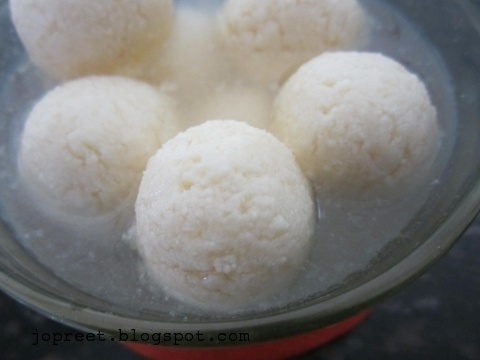 Rasgulla looks delicious!